"Anatomy of a Coup" is a compulsive and moving recoriding based on a journey through political upheaval in Africa, Asia, South America and the Caribbean. The album has been described as 'a hidden jewel' and a 'more accessible version of Sigur Ros [with] soft, beautiful subtleties' (WCUR 91.7 FM); 'beautiful stuff [and] fascinating and gorgeous music' (WLUR 91.5 FM); and '[an] independent, contemporary expression, against the background of awareness of change and social struggles... which can save world music from dying out by bringing new life to it' (Radio Centraal, Belgium). 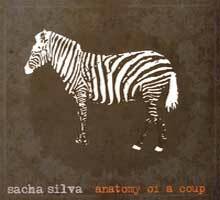 The second album by guitarist Sacha Silva with multi-instrumentalist Andrew Morgan and vocalist Munya B, the CD is a unique blend of flamenco, Indian classical and modern music, with lyrics sung in Hindi and Bengali. "Anatomy of a Coup" represents a new kind of world music: one which respects the cultural origins of melodies and rhythms while endlessly combining and recombining them to create new shapes and ideas; one which speaks to a new generation of global wanderers, travelers, immigrants, expats and half-breeds. The CD, recorded in southern Spain and the UK, is a bold follow-up to the trio's debut "Susurro", which was given a five-out-of-five "Editor’s Pick" rating by CDBaby (who called it "jaw-dropping", "unforgettable", "stunning" and "captivating") and was featured on radio shows throughout the US and Europe (including BBC radio).